In Shane Manier’s debut chapbook, Fallen Heroes of the Awful Waffle, the reader first experiences Manier’s voice as that of an observer—perhaps an empath—who shares in the pain of humanity and later as a self-proclaimed hero. The poet documents pain in others: pain in the waitress, “young, / and clawing / in her festering nest” (“Driving Back”), in an ex-rodeo clown, “a studded soul” with “cracked ribs” from the “monster bull” who “flung him up like a cat toy” in a career-ending incident that left him “[seeing] the stars of Texas” (“Buckeye Bronson’”), and then, as Manier records the antics of ghosts as they dance among folks in the diner, she makes her work universal by revealing pain both in a man who resembles the father of the speaker and in her own vulnerable soul. But frivolity, often in the form of flirtation, exists amid life’s pain and drama. A group of nurses, “tattooed with glory and grief,” smile “sugar tea smiles” at truckers and sing “to the juke box.” as they “pluck the bones of living prayer out / of their teeth.” Manier wonders if they “see their own beauty.” (“Apron Angels”) Isn’t this at least a search for happiness? Jokes and smiles break the tension and lighten the mood in the diner, as they do in much of daily life, but is there joy in the lives of these ordinary folks who wander in and out of diners? The poem “Untold Story” tells a lot. The poet /narrator has “spiked in [her] hound senses” as she waits for input only to realize “maybe tonight / [she’s] the fallen hero.” Fallen, yes. (And perhaps I’m reading a bit of myself into the book, for Manier employs the language of faith with ease and conviction.) But why “hero”? Why, indeed. And when will this book address joy? Manier’s poems show rather than tell. Her poems are set in various diners under the nighttime sky. The world is always different at night, glare more august, contrast more extreme. A prostitute and a family of Muslims are in the “same alleyway,” where she “wash[es] / her mouth our with soda / after business,” and they, “on a blanket beside / the dumpster,” pray as they face Mecca. Time isn’t laid out tick for tock…. the past, the future, the present…. as the past kisses the present…. There is more. Manier’s book includes the joy of a prayer. Manier shapes her poems to indicate what she knows: true heroes—always fallen, always flawed and human—are like all of us. Pain, frivolity, and joy become past, present, and future stirred with a spoon just as they truly are in everyone. The word bubble (“When Waffles Collide”) does not dismiss a poor, troubled plight but neither does it allow poverty to define people. 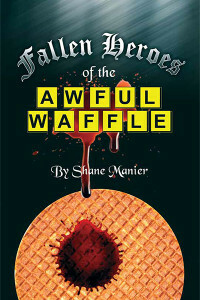 Fallen Heroes of the Awful Waffle by Shane Manier is a thin volume, but oh! so worth the read. Her poems make me cry because she has reminded me of how very glad I am to be human.